Estate, beautiful and colorful poster that has been untouched with original fold marks and is in excellent condition. This hard to find large poster, measuring 40 inches by 28 1/4 inches, "Doing All You Can, Brother? 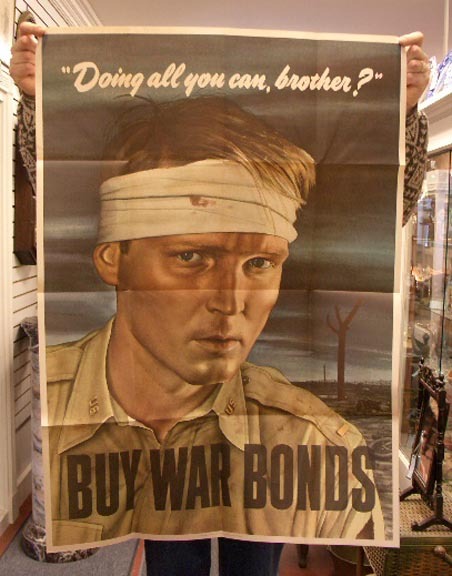 - Buy War Bonds," was created by the United States, Department of the Treasury, United States, War Savings Staff, and had been done by noted artist, Robert Sloan and published by the U. S. Government Printing Office, Washington, D. C. in 1943. 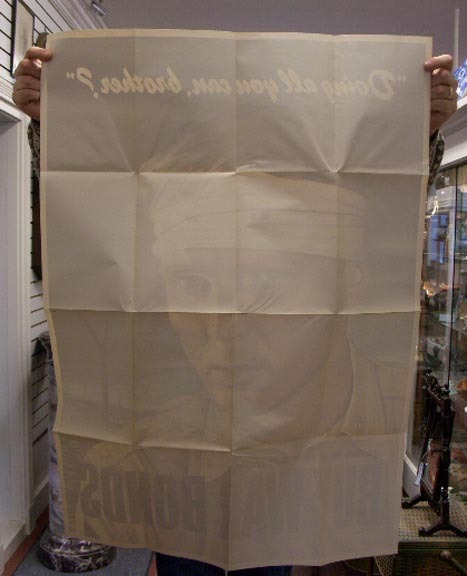 This colorful poster shows a close up of a soldier with a bandaged head and a blood stained khaki uniform. He has light colored hair and blue eyes. The background is of a barren field, scattered with broken or abandoned machinery. A wonderful bright and colorful poster from our past. Estate Ringling Bros. original poster from the acrobatic circus family who performed on the show. Circa 1930's and measures 56" x 74". This is an original lithograph, featuring a roaring leopard head in the center of the poster with a green background. Ringling Bros Barnum & Bailey appears on the top of the poster, with the leopard head in the center, Circus below the leopard and the greatest show on earth at the bottom in an Earth globe. It has the watermark, Local No.8, Amalgamated, Lithographers of America, Union Label, Cincinnati on the bottom right. 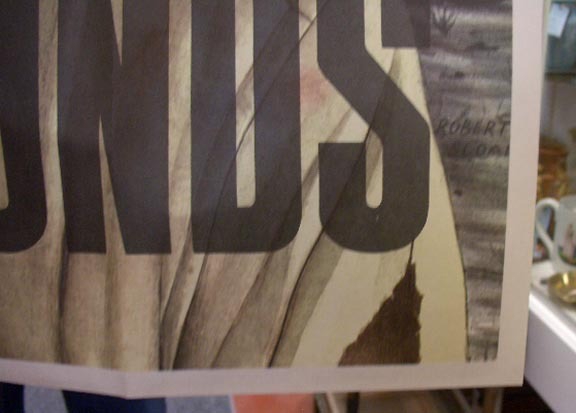 On the back of the poster there is a stamp as well. This poster is in good condition for the age with very bright colors. As it was originally, folded and rolled, so there are fold and roll marks and some minor tears in the seams. A very minor seperation in the seam, along with a very minor tear in the top of the center seam and in the side of the U in circus, which you will see in the photographs provided. Estate Ringling Bros. original poster from the acrobatic circus family who performed on the show. Circa 1930's and measures 56" x 74". This is an original lithograph, featuring a roaring leopard head in the center of the poster with a green background. Ringling Bros Barnum & Bailey appears on the top of the poster, with the leopard head in the center, Circus below the leopard and the greatest show on earth at the bottom in an Earth globe. It has the watermark, Local No.8, Amalgamated, Lithographers of America, Union Label, Cincinnati on the bottom right. 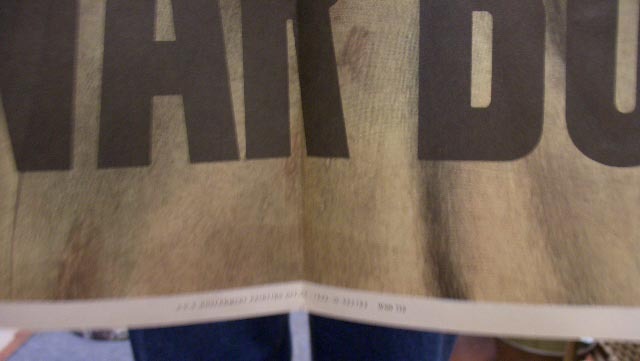 On the back of the poster there is a stamp as well. This poster is in good condition for the age with very bright colors. As it was originally, folded and rolled, so there are fold and roll marks and some minor tears in the seams. A very minor seperation in the seam, along with a very minor tear in the top of the center seam and in the side of the U in circus, which you will see in the photographs provided.